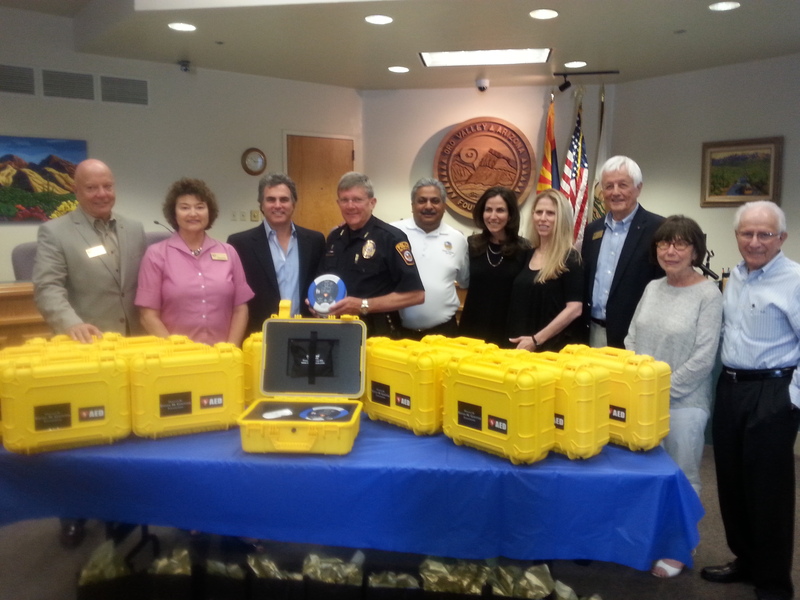 Chief Daniel Sharp, holding one of the donated HeartSine AEDs, is joined by Mayor Satish I. Hiremath (on his right) and staff of the police department and the Steven M. Gootter Foundation. The AEDs were donated by the Steven M. Gootter Foundation, an Arizona-based organization dedicated to saving lives by defeating sudden cardiac death through increased awareness, education, and scientific research. During an SCA, the HeartSine samaritan® PAD 350P AED analyzes the heart rhythm and, if needed, delivers an electrical shock to victims in order to restore the heart to normal rhythm. It is designed especially for use in public areas inside a lightweight and easy-to-operate system. With 84 percent of Sudden Cardiac Arrest events taking place outside of the healthcare setting, including at public parks, schools, and during sporting games, it is important to have an AED nearby in the event of a SCA emergency. The HeartSine AEDs will be stored in rigid watertight carrying cases and kept in the police officers’ SUV cars in case of a cardiac emergency.